Written by field experts, Neuroimmunology in Clinical Practice fills a void in traditional neuroimmunology literature, which tends to cover the discipline’s scientific aspects with little emphasis on clinical applications. 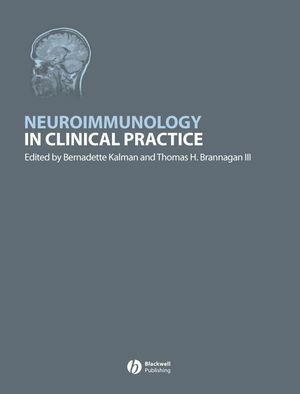 This unique book is essential reading in clinical neuroimmunology. Dr Bernadette Kalman, Director of Research and Associate Professor of Neurology, Syracuse VAMC, SUNY Upstate Medical University, and Dr Thomas H. Brannagan III, Associate Professor, Weill Medical College of Cornell University, have assembled a team of leading neuroimmunology researchers and practitioners worldwide. Part I: Basic Science Introduction to Clinical Neuroimmunology. Editor: Bernadette Kalman. 1. The basics of cellular and molecular immunology. Amy Lovett-Racke, Anne R. Gocke, and Petra D. Cravens. 2. Major components of myelin in the mammalian central and peripheral nervous systems. Alexander Gow. Part II: Inflammatory Demyelination in the Central Nervous System. Editor: Bernadette Kalman. 3.1 Epidemiology and genetics. Bernadette Kalman. 3.2 Immunopathogenesis. Thomas P. Leist. 3.3 Courses and diagnosis of MS. Bernadette Kalman. 3.4 Clinical features. Bernadette Kalman. 3.5 The pathology of MS: a quest for clinical correlation. William F. Hickey. 3.6 Cerebrospinal fluid. Mark Freedman. 3.7 Magnetic resonance imaging characteristics of MS. Jennifer L. Cox and Robert. 3.8 Treatment of MS. Sean J. Pittock. 4. Devic’s disease. Bernadette Kalman. 5. Acute disseminated encephalomyelitis and related conditions. Robert S. Rust. Part III: Autoimmune Diseases of the Peripheral Nervous System and the Muscle. Editor: Thomas H. Brannagan III. 6. Guillain-Barre Syndrome. Eduardo A. De Sousa and Thomas H. Brannagan III. 7. Immune mediated chronic demyelinating polyneuropathies. Thomas H. Brannagan III. 8. Immune mediated autonomic neuropathies. Louis H. Weimer and Mill Etienne. 9. Autoimmune myasthenic syndromes: myasthenia gravis and Lambert-Eaton myasthenic syndrome. Andrew Sylvester and Armistead Williams. 10. Polymyositis and dermatomyositis. S. Christine Kovacs. Part IV: Disorders of the Central and Peripheral Nervous Systems Related to Known or Assumed Systemic Immune Abnormalities. Editor: Bernadette Kalman. 11. Neuro-Sjögren's syndrome. Bernadette Kalman. 12. Neuro-Behcet's syndrome. Bernadette Kalman. 13. Steriod responsive encephalopathy associated with Hashimoto's thyroiditis. Bernadette Kalman. 14. Rasmussen encephalitis. Bernadette Kalman. 15. Susac’s syndrome. Bernadette Kalman. 16. Cogan’s syndrome. Bernadette Kalman. 18. Anti-VGKC syndromes: Isaac's syndrome, Morvan syndrome and Autoimmune limbic encephalitis. Bernadette Kalman. 19. Paraneoplastic neurological autoimmunity. Daniel Lachance and Vanda. 20. Vasculitis and connective tissue disorders. David S. Younger and Adam P.J. Younger. 21. Post-streptococcal movement disorders. Gavin Giovannoni and Andrew Church. 22. Neurological manifestations of gluten sensitivity. Marios Hadjivassiliou. 23. Anti-GAD associated neurological diseases. Marios Hadjivassiliou.